The Black Cross is a great historic pub, its gone through a lot of ups and downs. Currently its just about on an up I'd say, the staff are quite pleasant and normally the place has a decent choice of beers on. The gardens a nice sun trap though the place is pretty scruffy. Given the lack of competition in the town it should be doing well. Join in and write your own page! It's easy to do. How? 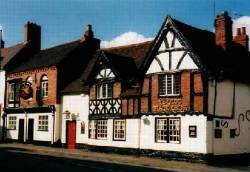 Simply click here to return to Bromsgrove Pubs. This Website Was Built With Sitesell - Sbi The Worlds Most Sophisticated Online Business Building System. Copyright © 2004 - 2010. All rights reserved. LocalWiki Bromsgrove.